I did refrain from buying my son the adorable dress shorts – but these cute ice cream pops I just couldn’t resist! You can make these as fancy or as simple as you want. I used store-bought brownies, frosting, and ice cream, so nothing here is “from scratch”, but once they’re all combined here, it looks like you put a lot of time and effort in, even if you didn’t. It’s a really fun fake-out! 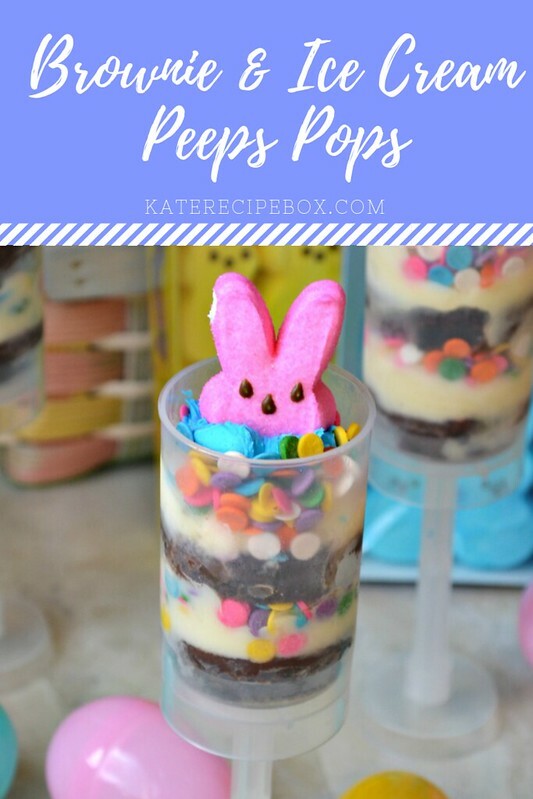 I suggest using a different icing color than the color PEEPS you pick to use – the contrast, along with the sprinkles, make these so fun and colorful. They’re much like an individual ice cream cake – definitely something the kids will love – but something the adults will appreciate too! Also, if you’re as much of a PEEPS fan as I am, you’ll want to pop over and enter our #SpringSweetsWeek giveaway! Peeps is offering up a PEEPS® & Co. gift card for candy and apparel, and since I can’t win, I’m rooting for one of you to! There are also amazing prizes from the other #SpringSweetsWeek sponsors. The size of your molds will dictate how much brownie, ice cream, icing, and sprinkles you need. Make sure you have your molds before you start so you know how much of the rest to get. 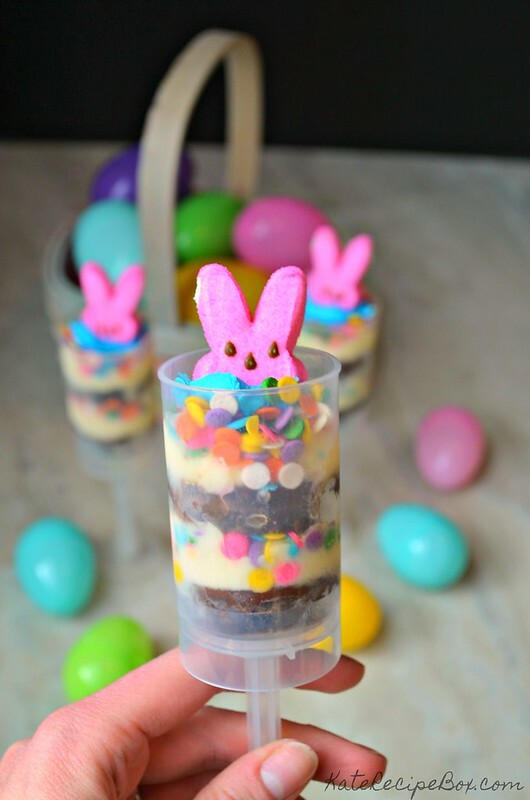 Use one of the push pop molds to cut out 12-24 brownie disks. Now those are some adorable little trifles. Perfect recipe…..easy, peasy and delicious. oh mylanta! these are so adorable!!! I almost cant take it! lol! These are adorable. 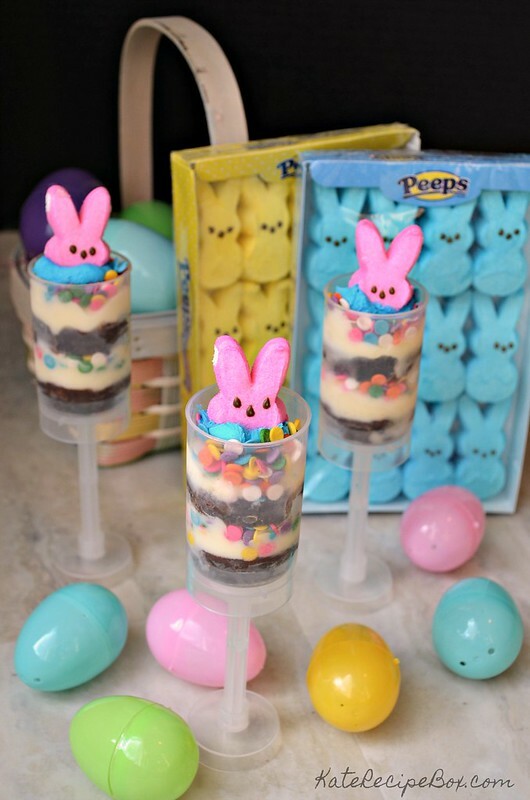 PEEPS are my moms favorite and I’m totally making these for Easter since her birthday is the week before! I have been wanting to try those pop up cups. This is my inspiration to try them. These look super cute! I bet the kids love them. Both big and little. These are so cute. My toddler would be all over these! Kate these are soooooo cute! I know my kids would love them, but I want one too! 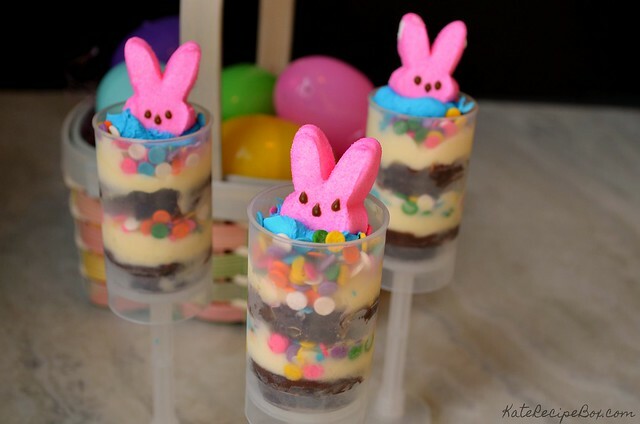 I love pink bunny PEEPS and love to see those cute ears on top! I can’t even tell you how big of a hit these would be with my kids. What a fun treat. These are so adorable Kate – my kids would love these. Need to buy some of those molds, asap! Thank you for this cute idea, Kate! I made this a few days ago and my kids loved it! This was so delicious that they can’t wait when I cook this again. I can see where these would be popular all year round!They are adorable!